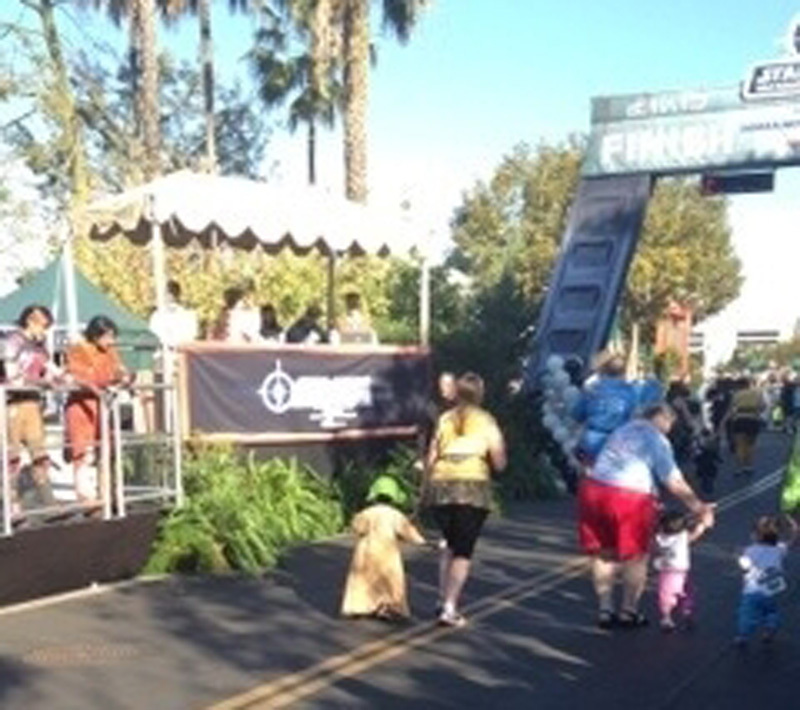 Yesterday Kate shared her experience running the Inaugural Star Wars 10K with her son. 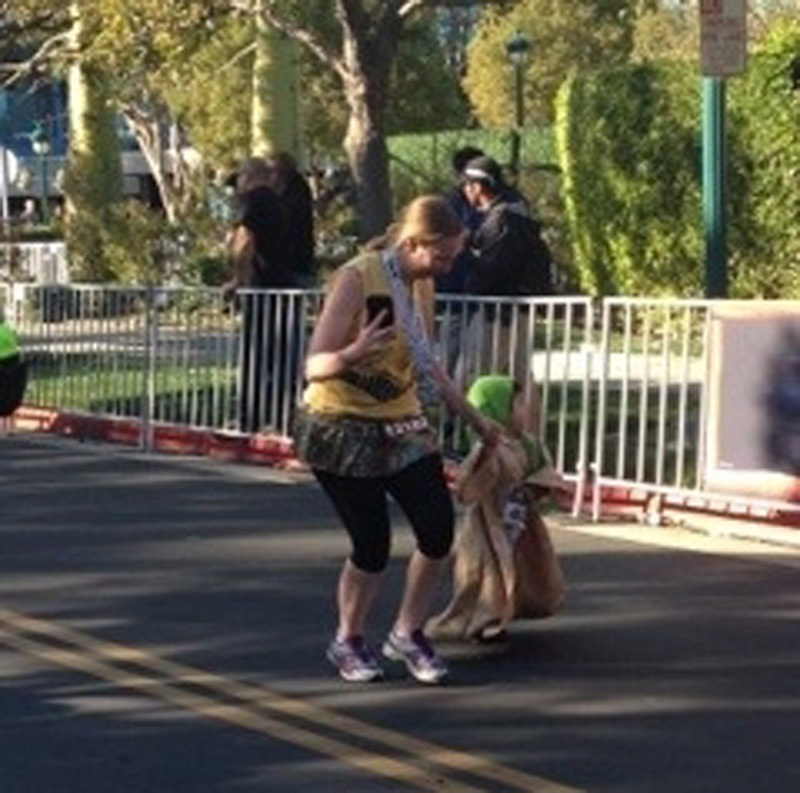 Right after that race, she took her 3 year old on his first runDisney adventure running in the Star Wars Kids Races! Try not to freak out over his adorable costume…I totally did! Kids Race morning started early for us, since I ran the 10K with my older son, Russell, and friend, Lori. We went straight from the race finish line to the Info Tent to beg for my younger son’s bib. I was so worried about picking up my older son’s 10K bib because he had no photo ID, that I didn’t realize until we got back to the hotel that I didn’t have William’s Kids Race bib. Given the amount of bibs and bags I was handling, I assumed I dropped it and therefore it would be a hassle to get a new one the morning of. But it was there in the box at Info, so…whew! I’m happy he was able to get his personalized bib, because every kid needs his first Disney bib preserved for all time! The corral entrances were very well marked, and well-guarded by cast members – one, and only one, parent was allowed in with the kids. 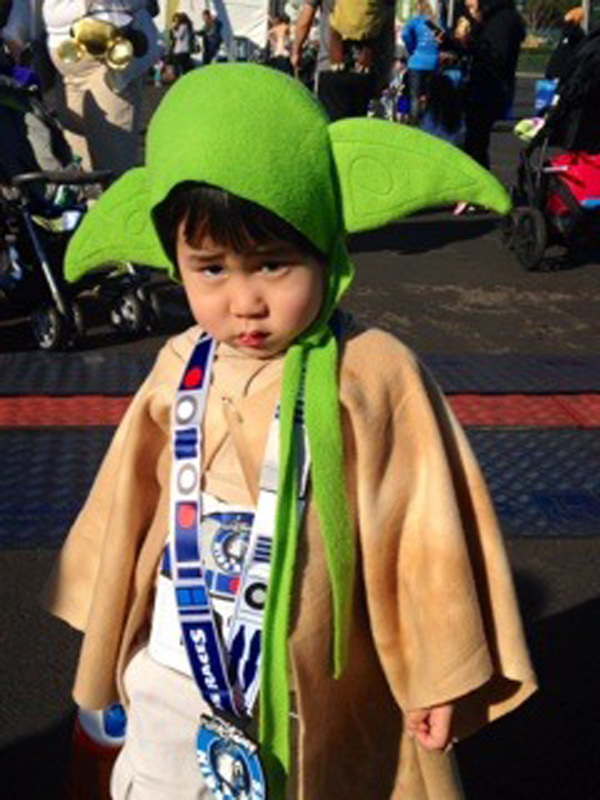 After getting Yoda into his costume, my entourage headed to the finish line to take pictures while I went into the 1-3 corral with William. 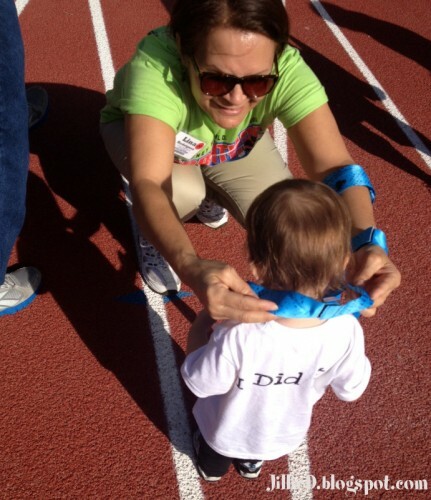 There were four races for kids – the Diaper Dash for the Under Ones, the 1-3s, the 4-6, and the 7-8s. WDW runDisney events have the mile run for 13 and under, but I assume there’s not enough room in Disneyland. 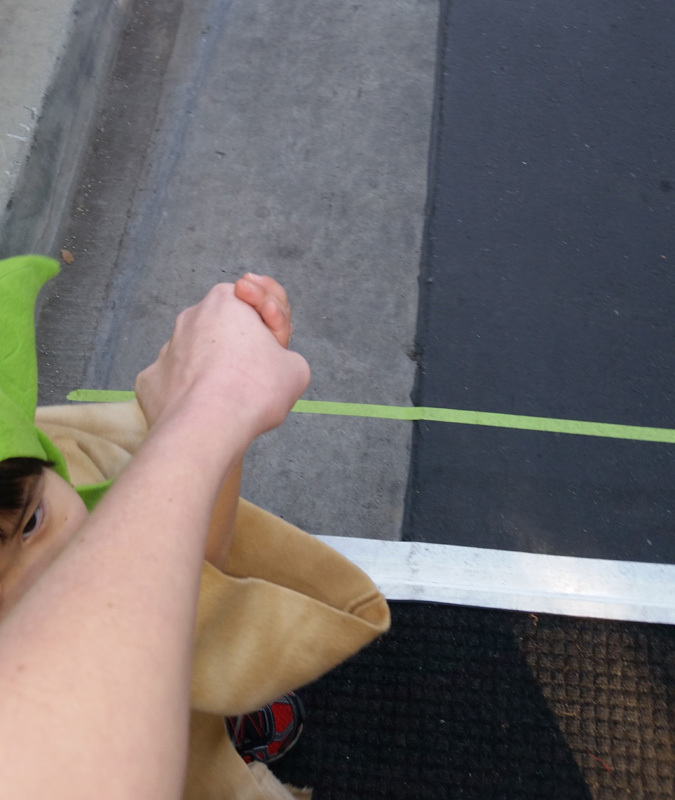 I made his Yoda costume out of fleece so I didn’t have to hem them. 😉 I found the costume and ears here (I enlarged the size by about 500%!) and the robe here. The hat isn’t very hat-like because I’m not a great 3-D sewist, and I added ties to keep it in place. The kids go in waves of about 5-6 each time, and it is very organized for what is, essentially, herding cats. The start line is taped off so each child has a ‘gate’, and they wait till each wave is nearly to the end before starting the next one. Once we finally reached the front, we got the “Ready, set, GO!” and immediately…stopped and looked around. Toddlers are the worst racers. He was so distracted by the people along the edge, and the other kids’ costumes, that I was pretty much dragging him along toward the finish line. I don’t really blame him – there’s nothing cuter than a barely-walking little girl in a Chewbacca tutu. At this point, it seemed like it was taking longer than the 10K to get to the finish line. But we did manage to pass some of those babies right at the end. Thank goodness. He was quite happy to receive his medal! All the Kids Race bibs have a tear-off number for the parents to claim the correct child (not just the cutest one), and I had mine in hand as we approached the cast member to get out of the finish area. These situations make me nervous, as William is adopted from Korea. I shouldn’t have worried – the CM checked the numbers and didn’t bat an eye as she waved us through. They probably see a lot more families that don’t look alike than I have experiences being that family. We collected the entourage, danced to the after-party music, and took some pictures of the whole group. My kids are adorable. And horrible at pictures. 2015 WDW Marathon Weekend Kids Races! What better way to get kids active and healthy then to get Mickey Mouse involved?! runDisney Kids Races are held during every race weekend, but we don’t hear much about them. They seem to get lost in all the hoopla around the big races, when in reality they are probably one of the highlights of the weekend! I mean they are just TOO CUTE! 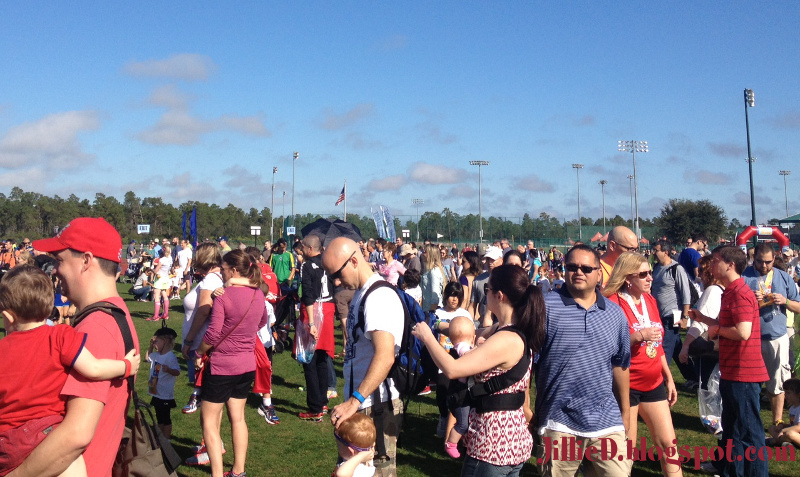 Well after Melissa ran the 10K this year, she headed over to the ESPN Wide World of Sports Complex where her son participated in the Kids Races for the 3rd year. You might die over his tracksuit!! Disney’s Kids Races are my favorite part of Marathon Weekend. This is how Disney hooked our family for the races. 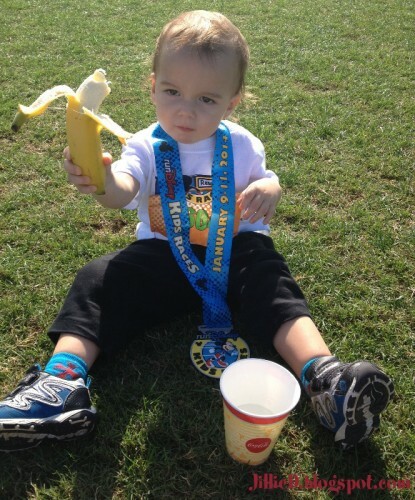 There truly is something for every member of the family at Marathon weekend. 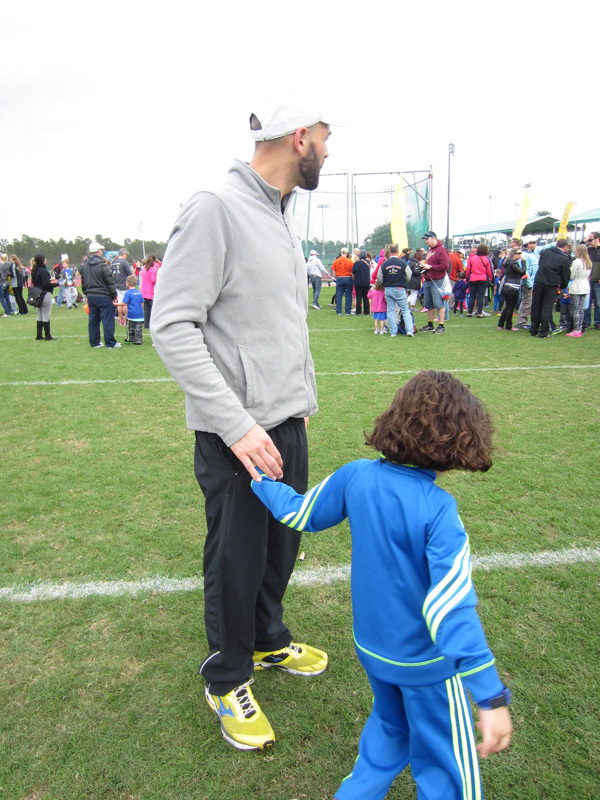 You can walk any of the races or run your heart out from young to old. 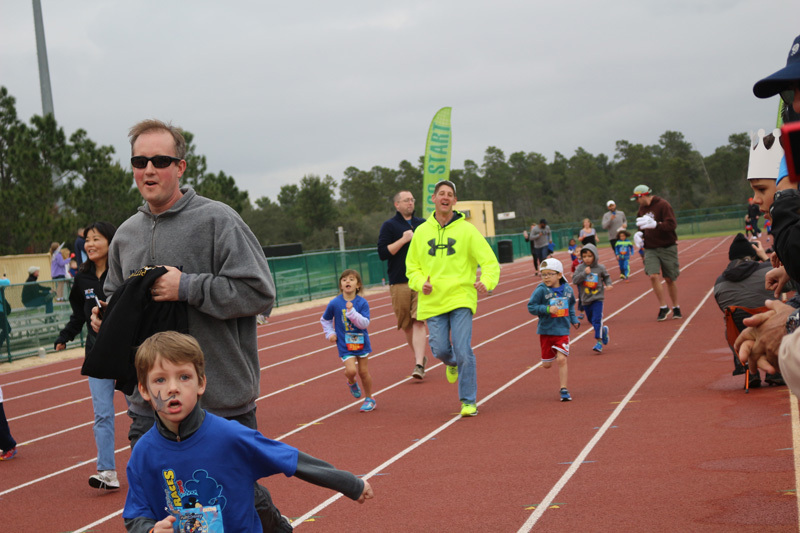 This year is our 3rd year doing the kids races and the changes that Disney made this year were FANTASTIC. Packet pickup for the kids was easy and fast. Unlike the adult races you get the shirt right there with your child’s bib so it makes the process just a little faster without having to go to a second location at the Expo. This year the kids race shirt was blue! I was thrilled as the last 2 shirts my son has were white which were stained and pretty unwearable before we even left the parks. However a this blue shirt will be around until it does not fit! My son was running the 200m dash for ages 4-6, so he was the second batch of kids running as they start with the 100m. 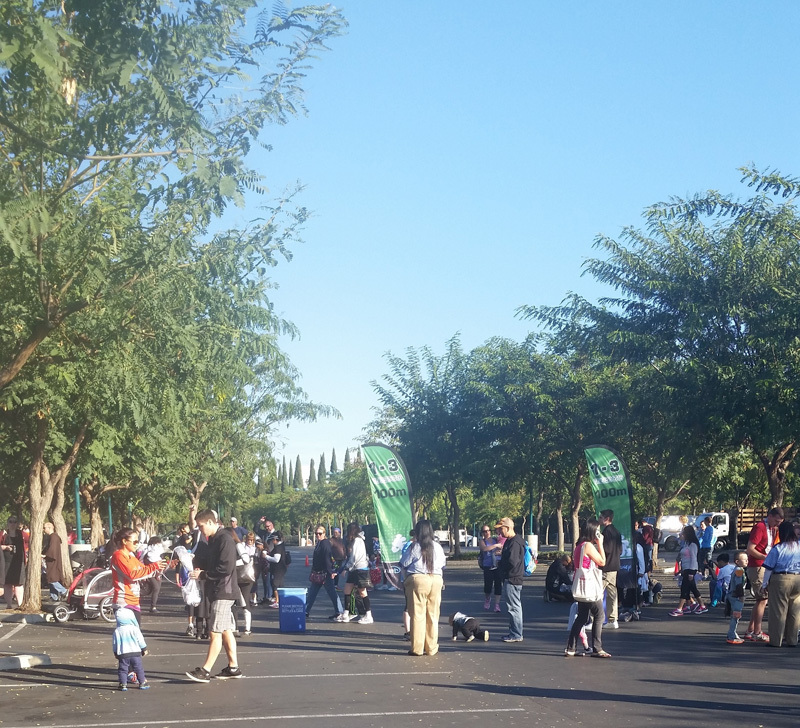 The kids races started at 11:00 am on the dot with the first wave of 100m little runners. 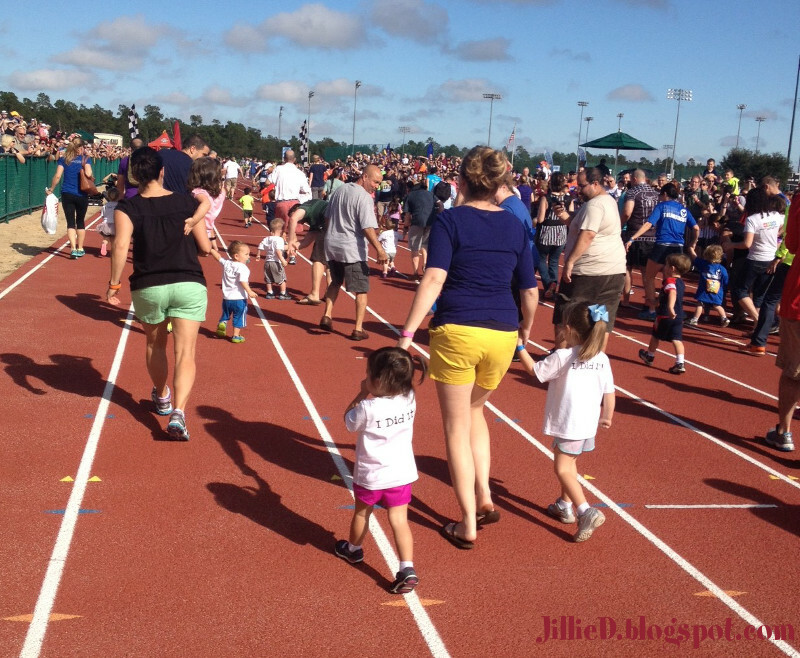 The 100m dash is for kids 1-3 and usually the most fun to watch. Lots of crying kids who just don’t understand what they are supposed to do while everyone and Mickey Mouse cheer them on. My sons distance would be starting around 11:20 am and he actually ran at 11:25 am. You can always count on Disney for being punctual! There are no set corrals for the kids race however they do start in waves. Parents and kids just line up at the start line and go when they are told. My husband waited with my son while I got a spot close to the finish line to take some pictures. This year they started at a different part of the track running in the opposite direction as last year. I felt that this gave way more opportunities for pictures. The center of the track also felt less congested from last year and they started less children in each wave which was fantastic. I did not see one parent knock over a child do to over crowding and it also gave the kids a bit more space to run their little hearts out. I love that parents can run with their kids but kids also have a parent claim tag attached to their bib that you can get your kids at the finish line. With so many kids and parents around it doesn’t hurt to have the claim ticket just in case you get separated. At the finish line Mickey Mouse is waiting for the kids to give hugs and high fives before the kids get their hard earned medals. Just like the adult races once you get your medal there is water and snacks for some post race fuel. 200m is a long distance so my son was sure to make sure he had some snacks! 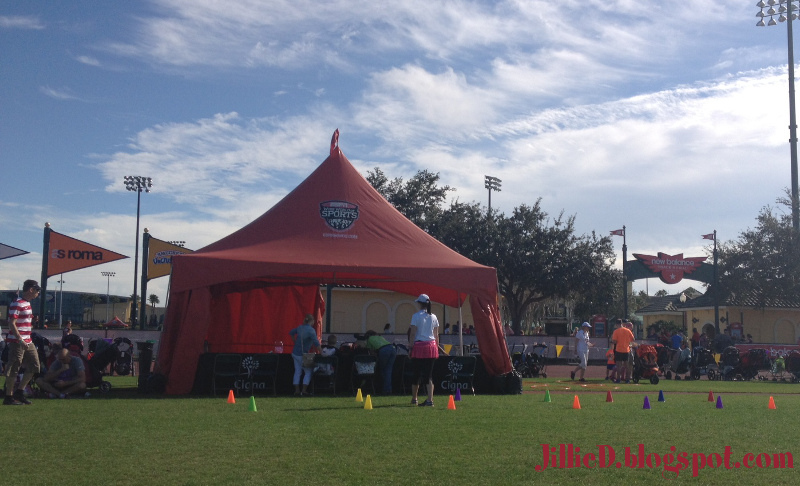 After the race we explored the 2 tents of activities located in the center of the track. One of the tents had caricature artists and the other had arts and crafts for the kids to do such as crown making and coloring stations. It was nice to have something to do before and after the race. Since the kids races are very short it did help expand their experience. We did not wait in the line for caricatures since it was pretty cold and windy but they did have some adorable car magnets with the kids race distance on them. My son said it was the best race yet and I have to agree. Overall the Disney kids races do not disappoint. They truly have a way to make the kids feel like they are a big part of marathon weekend and entertain us parents at the same time. Plus where else at Disney could you have a cool experience, a Disney shirt, race medal and some snacks for under $20! Melissa Rubenstein is a Family Chiropractor in Miami and a Homeschooling Mom. She is married to a streak runner and has completed numerous runDisney races. Jillian Davis and I ran our first 5K together in 2010 and many others since, a few of which when she was pregnant with her adorable son Cole. Now she is turning him into a runDisney regular! I’m so excited to welcome her to Running at Disney (it’s about time!) 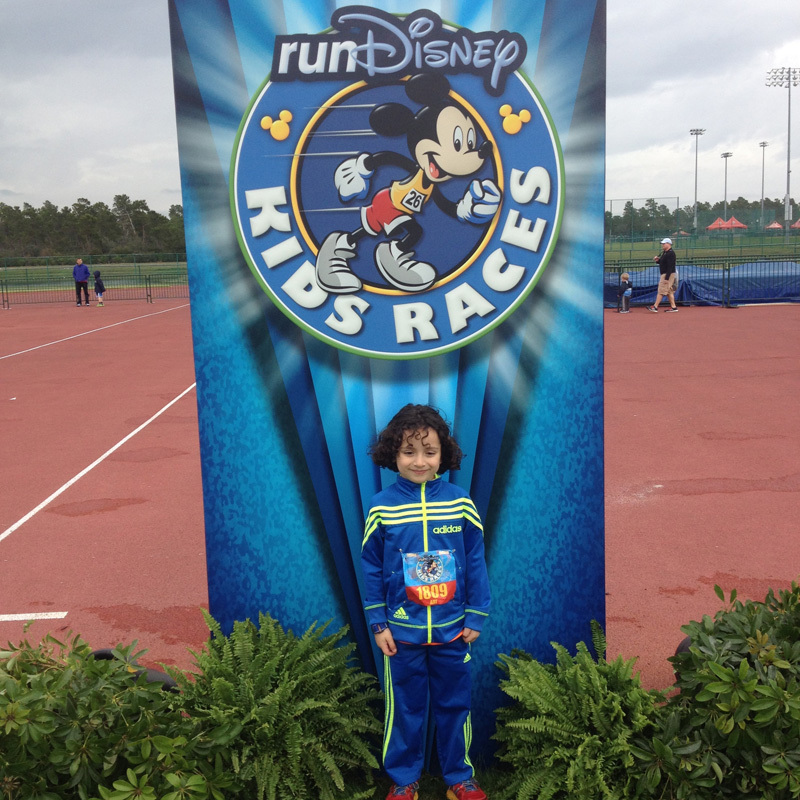 to share her experience at the Kids Races during the 2014 Walt Disney World Marathon Weekend. Be prepared for some serious cuteness!! During the Walt Disney World Marathon Weekend, runners race in the 5k, 10k, half marathon, full marathon, and combinations of those for the Goofy and Dopey. 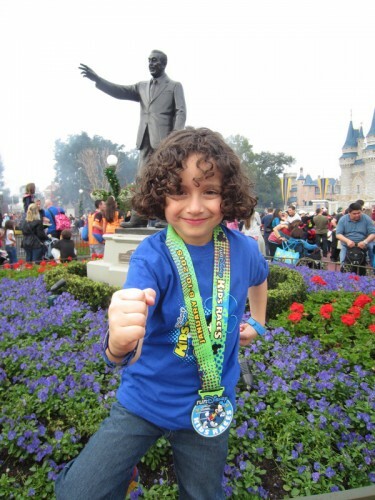 Did you know that runDisney puts on some of the best Kids Races too? 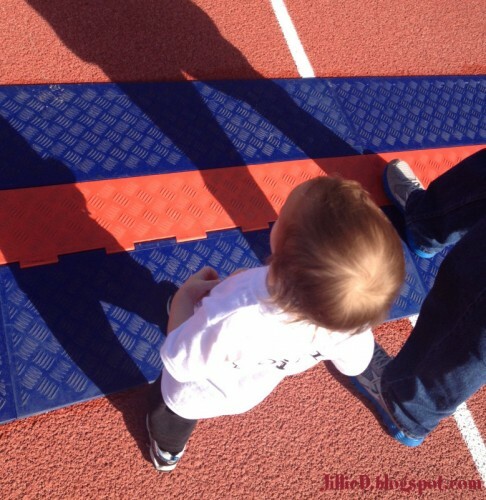 Kids 13 all the way down to just learned how to crawl can participate in the Kids Races! 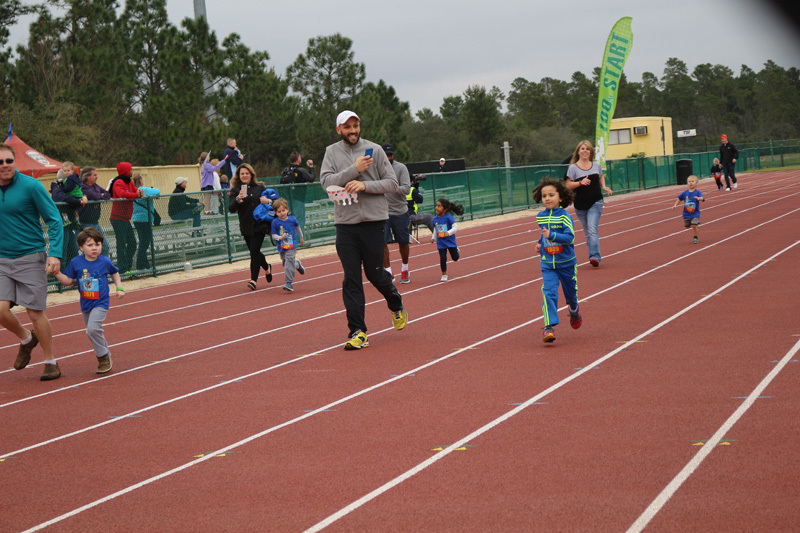 There are five different categories to the Kids Races; a Diaper Dash for those 12 months and under, 100 Meter Dash for those 1-3 years old, 200 Meter Dash for those 4-6 years old, 400 Meter Dash for those 7-8 years old, and the Mickey Mile for those 13 years old and younger. Dedicated space at the expo! The Kids Races have their own section at the expo, clearly marked and run just like the rest of the packet pick-ups for the rest of the races. T-Shirt! 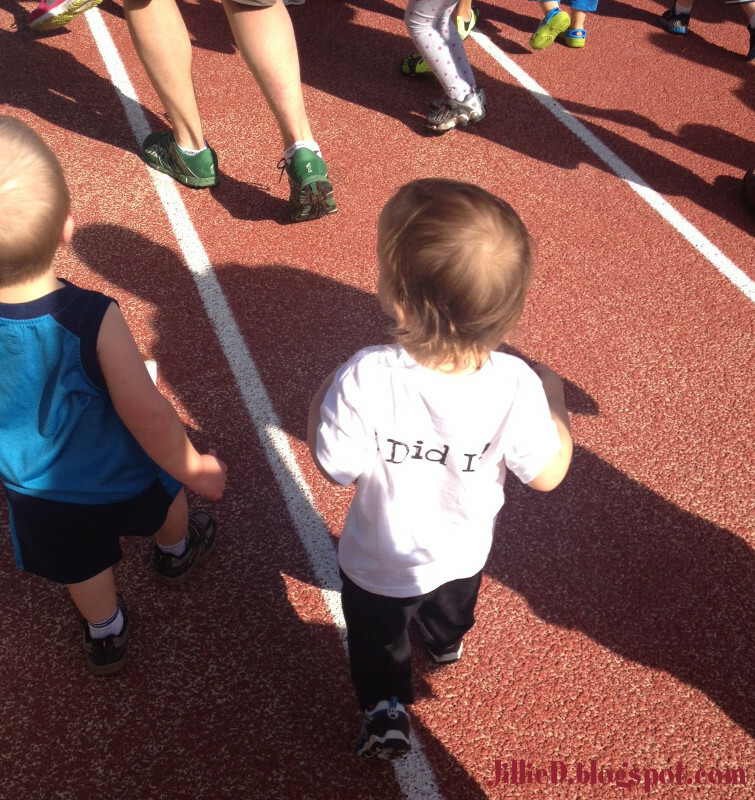 Your little one will get their very own “I did it!” shirt. Shirt sizes go from 2T, 3T, 4T, Youth X-Small- X-Large and Adult Small. I love that the shirts go down that small. Little Man wears smaller sizes and the 2T is a good fit. Medal! 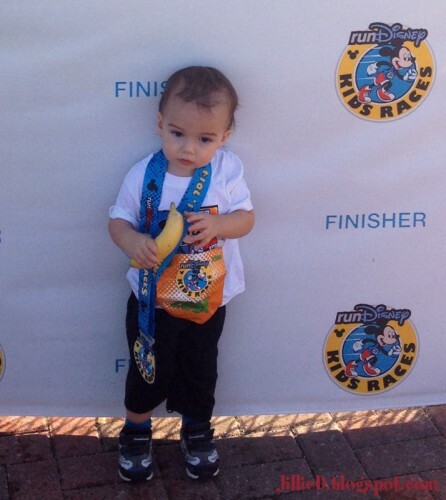 Most of us runners know that it is hard enough to find 5ks that give out medals. 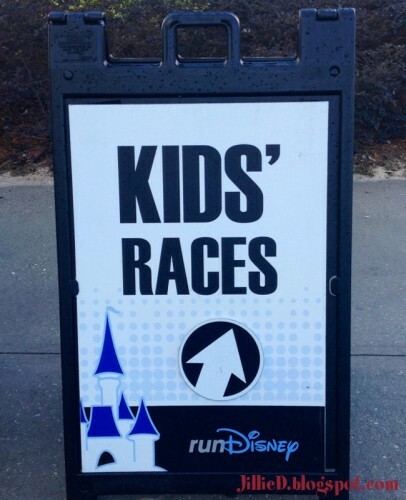 Well the runDisney Kids Races have them! If you’ve ever done a 5k with runDisney you know that they give out a rubberized medallion, well, that’s the kind of medal the kiddos get too! Little Man loves his little medal collection- (they are displayed on a hook he can reach) he constantly pulls them down, puts them on and parades around the house wearing them! Personalized bibs! 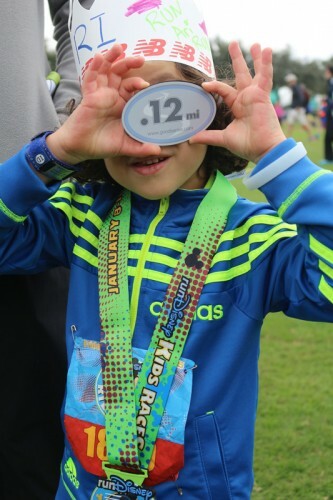 The Kids Races get a real race bib with their own number, and just like the longer races, if you get registered by a certain date, their name will also be on it! Another cool feature is for safety. There is a tear off parent claim ticket at the top. 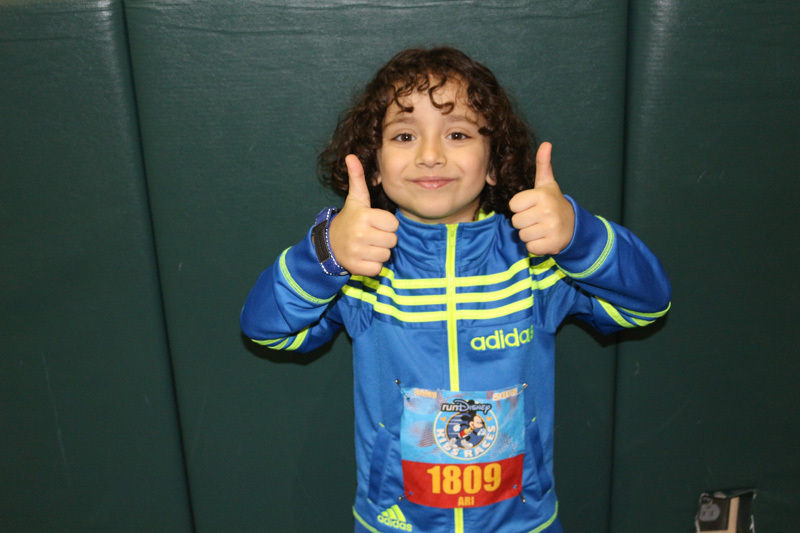 If your child races without you, you can only get into the finishers area by showing that claim number, that’s also how the VoluntEars know the children are leaving with the right people. For the Walt Disney World Marathon Weekend, the runDisney Kids Races were held at ESPN Wide World of Sports, at the New Balance Track & Field Complex. This is where they have been held for the last three race weekends, in the past though, I have seen them held at Epcot after the Princess 5k there. They were held on Thursday, Friday and Saturday, with warm ups and activities starting at 10am. 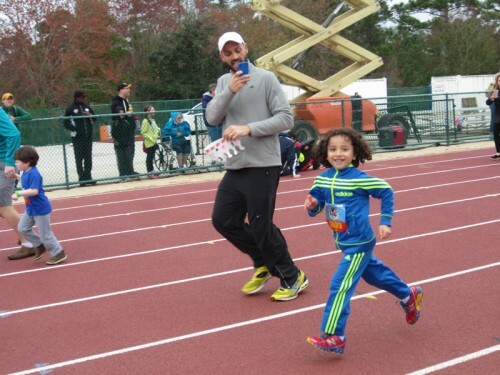 Personally, I felt that it was way late, especially after having run the 10k Friday morning, we were done by 8am….the other thing that bothered us was the actual start time- the 100m (remember 1-3 year olds) was at 11am, prime napping time. We heard several parents complain about that in our “corral”. Those we’re our only complaints though, and the Kids Races for the Princess Half Marathon weekend are much earlier, starting at 8:45am. Once you got over to ESPN Wide World of Sports, the path out to the Kids Races were clearly marked with large signs. 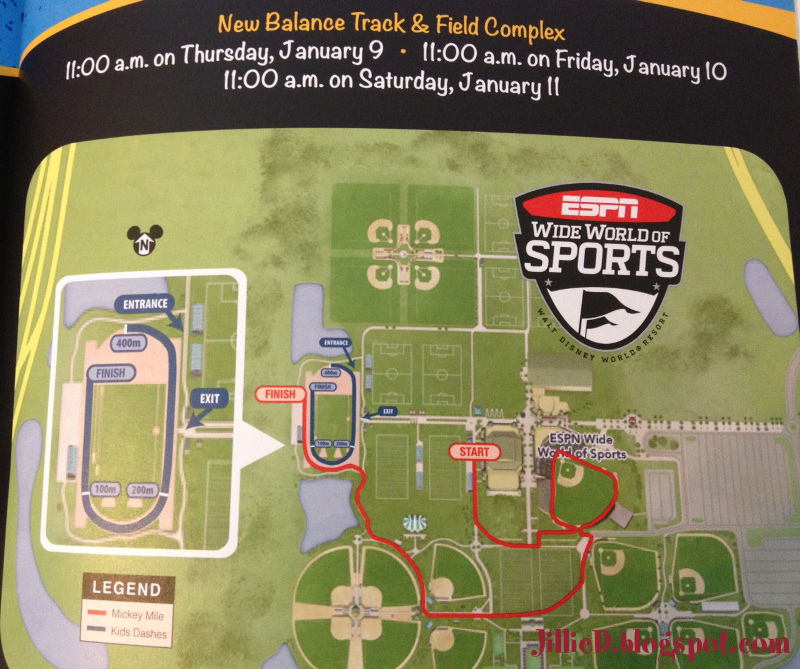 Inside the New Balance Track & Field Complex there was a lot going on! 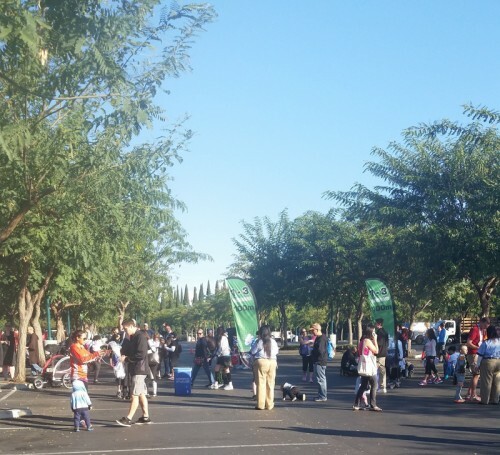 There were VoluntEars directing strollers to the optional stroller parking, a DJ, and games. There was a tent with bean bag toss, hula hoops, cone races and color books. The DJ was just like at the bigger races, entertaining the crowd, playing crazy songs, telling corny jokes, getting people to dance and move. Tent with pre-race games and activities- cone racing, bean bag toss & coloring books! Soon it was time to start lining up for the races. runDisney has made it extremely easy for this part. Each race group has its own starting line. Your child’s bib is color coded to match their race distance. The ‘’corral” area and starting line will match that color. 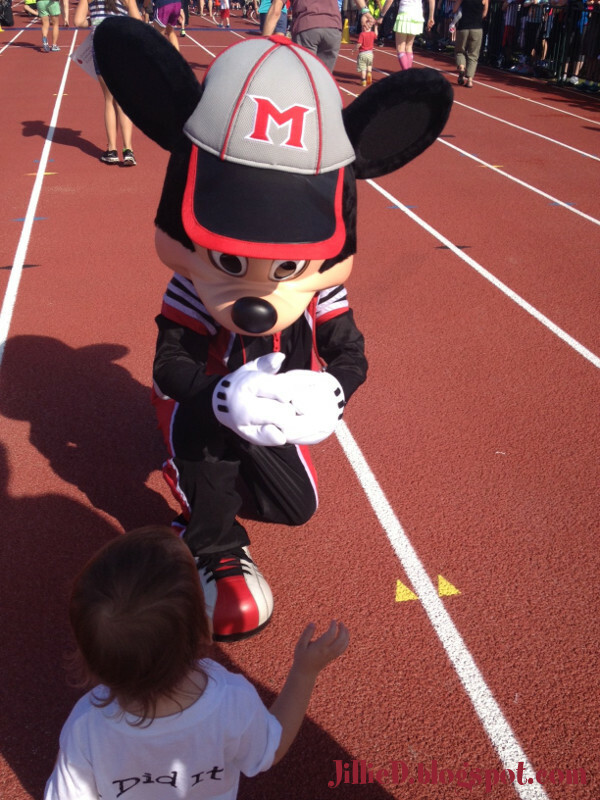 Since this is just a kids race there is no time (the Mickey Mile is timed though), it’s just for fun. It’s very entertaining to watch the organized chaos that can happen in 100 meters. Kids that don’t wait for “go”, kids that just run their hearts out, little ones that are just learning to toddle, ones that want to walk from side to side instead of to the finish line (mine this time around), ones that just give up, or have stage fright, and need mommy or daddy to carry them. I’ve bribed mine with his pacifier and a lollipop before! They even have race course photographers! The highlight of the Kids Races is the special guest. 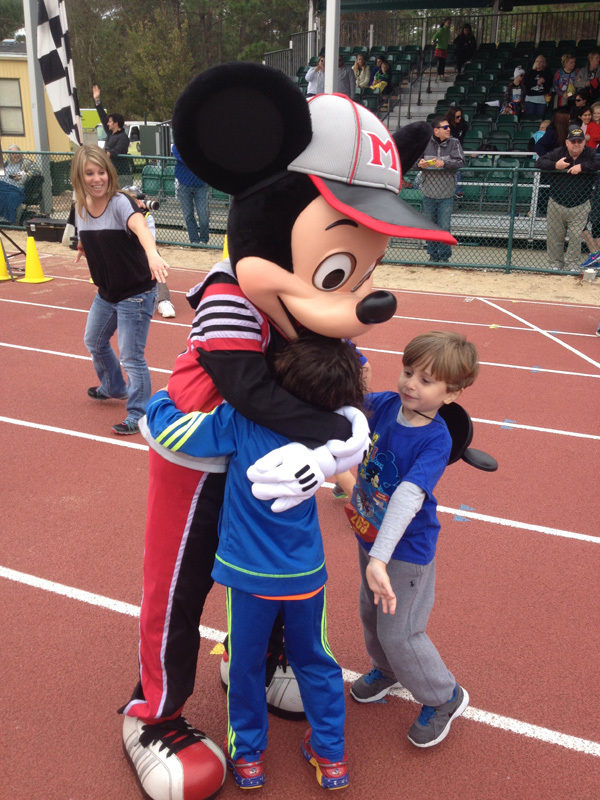 The first two races we did, Pluto was waiting at the finish line, and this time Mickey was in the middle of the course giving out high fives to all the kids. 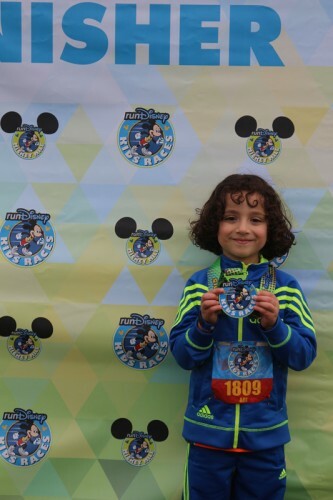 It seems like the special guest goes with the character on the shirt/bib/medal; it’s been like that two of the three races, the one that was off featured Donald (Little Man’s favorite!) but it was Pluto. The kids mob the character, and with the short turn around between waves and races, it’s hard to get a posed picture with them unless your child is fast on the course (mine is not, he’s on the younger end of the age bracket). They still do hugs and high fives though. 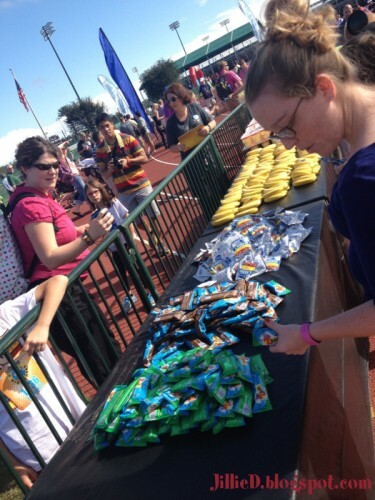 At the end, there are VoluntEars medaling the kids and there are after race snacks too. There is a nice assortment of snacks- fruit snacks, two different kinds of Clif Kids Zbars, Craisins, bananas and water. I also love that there are photographers to take pictures with the finishers background. After the photos, Cole does the same thing every time- finds a nice piece of grass in the middle of the track, eats his banana, drinks his water and watches everything around him. He loves watching all the other kids! So have your kids ever participated in the runDisney Kids Races? We’d love to hear what you thought of them! I know they will be something we will do fairly often, until he gets tired of them (hopefully not!) or he gets too old to do them. Update: Check out this great video runDisney posted from the Kids Races! You can see Cole giving Mickey a high five at 0:25 in the video! 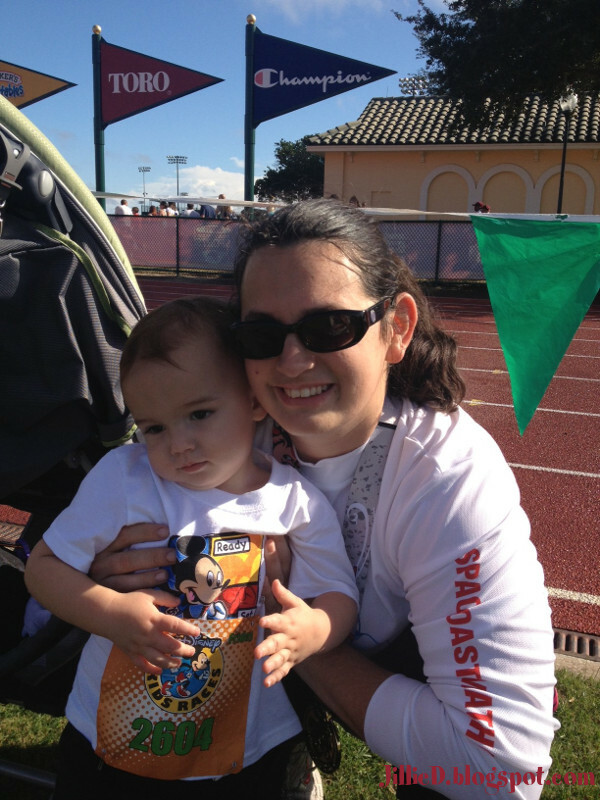 Jillian Davis is a crafter, part time blogger, runner, Disney parks goer, and mom to a runner-in-training toddler. 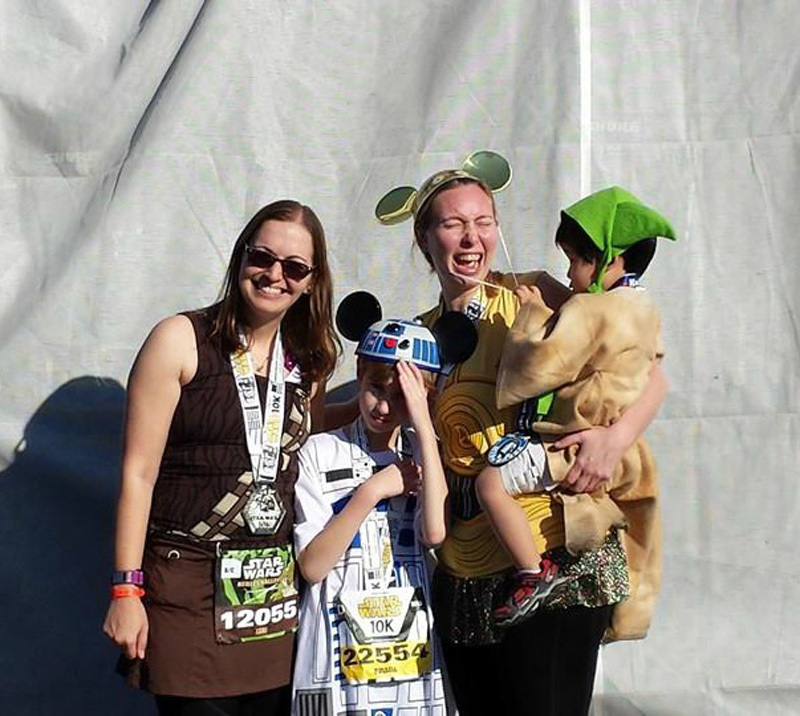 She did her first runDisney race in October of 2010, completed 5 5Ks while pregnant with her son, and he started runDisney races in 2013.